It was probably 4 or 5 years ago when I first stumbled upon a Xyron Create-a-Sticker 250 for sale in my local Wal*Mart. I bought it wondering how I would ever end up using it. Little did I know that I would soon find my life impossible to live without it. And not just for scrapbooking. I have used it for all kinds of crafts, some of which I will talk about in this article. First let's talk about what the Xyron Create-a-Sticker is. There are a few different models and the model number coincides the width of the sticker making option. The Xyron 150 makes a sticker 1.5" wide. I own the Xyron 250, which means that the widest option for a sticker is 2.5" wide. Likewise, the Xyron 500 makes a sticker up to 5" wide. They all work in essentially the same manner. You put anything in the slot, face up. Pull it through either manually or by turning a crank, and when it comes out the underside is completely covered with an even layer of adhesive. This process is shown below. And yes, my husband is totally digging his sticker. Now, let's get to the fun part. 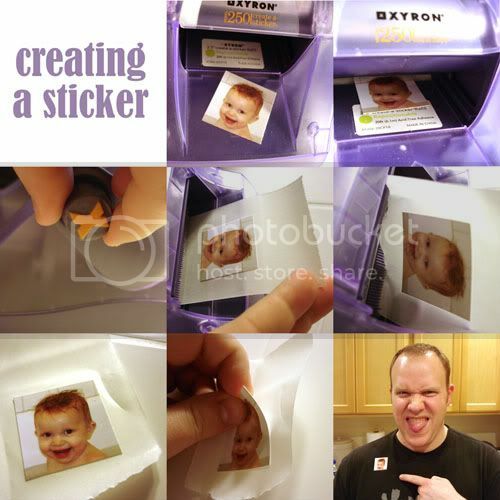 What can you make with your Xyron Create-a-Sticker? The answer: anything. Here are just a few of my applications. Adhere ribbon to projects. The primary way I use the smallest model is for applying ribbon to a layout or other project where you want the ribbon to lay completely flat. Before I got my Xyron I tried ribbon glue, which always bled through my sheer ribbons and was a sticky mess. I also tried regular adhesive runner tapes, which are too wide for some skinny ribbons and didn't hold very well. Feeding your ribbon through the Xyron Create-a-Sticker makes it perfect every time. Applying diecut alphabets. This machine is perfection for this task. After cutting out letters with my Cricut, I simply feed them through the Sticker Maker and they adhere perfectly. No trying to glue it, and no corners peel up. I used this method for the title in the following layout. Stickers for children. 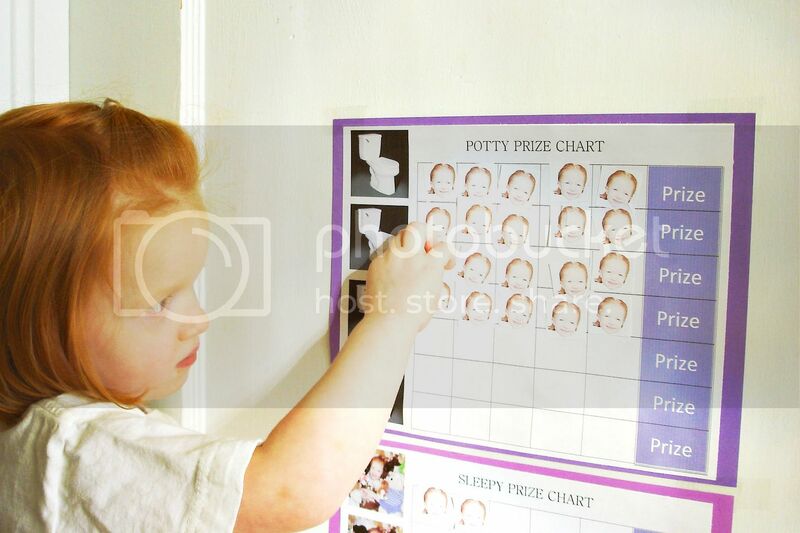 When my daughter was potty training I scoured the store for just the right stickers to fill her reward chart with. She declined every suggestion I made and finally I said, "Honey, what kind of sticker would you like?" And she answered "A sticker of me." I immediately went home, printed pictures of her face, cut them into small 1 inch squares and sent them through the Xyron. She was completely thrilled and was potty trained in a week flat. Last month this same daughter, who is now almost 4, would not eat her potato. While she was sitting at the table regarding her potato with disgust I jumped up and found some quick clip-art and printed out a small picture of a cartoon potato, waving gleefully, and typed I ate my potato around it. I printed it out and made a sticker of it. The bribe worked like a charm. Once she finished her potato she got her sticker. Soon after, I made a compete set for future dinner table rejections. Including, but not limited to, I ate my carrots, I ate my peas and I ate my ham. My girlfriend begged for some for her picky eaters and declared this a million dollar idea. Children's crafts. Last year we had our annual Pumpkin Carving Party. This was the first year we would have many children present and I wanted to make activities for them to do. The problem was all of the kids were under 4 years old. I grabbed my sticker maker, sheets of black foam and orange favor bags. I cut 16 various eye shapes, 8 various mouth shapes and 8 various nose shapes. I then ran these shapes through the sticker maker by category. The each child got to decorate the front of their orange favor bag (which was filled with candy and small toys) with a customized Jack-O-Lantern face. When they were finished I stapled the bag closed with a green leaf and vine. It was a huge hit, and after that party 3 of the attending moms ran right out that day and bought themselves a Xyron. I have also used it to put sticky onto the back of pre-cut foam craft kits that were not already backed with adhesive. Applying glitter to chipboard and paper. This project is truly great. 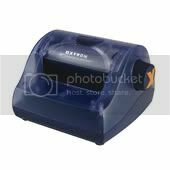 The Xyron can take any item up to the width of a nickel, so you can run chipboard through it with no problem. Run your chipboard shape through once right side down, then run it through wrong side down. You should now have a chipboard piece that is on the waxy paper and sticky on top. Simply shake the top with glitter and peel off like a sticker and adhere to project. Or, cover both sides with glitter and punch a hole in the top to make an ornament. - Many applications and uses. - Easy to use and install refills. - Fun and safe for kids participation. - Sometimes when creating stickers from die cut alphabets a web of adhesive remains in the cavities of the letters. I fix this by using a craft knife to swipe the edges. - The price in recent years has really jumped. I find the refills to last for a long time and I use mine heavily, but it still hurts me dropping $11 on a refill when I purchased my machine for $9.99 (it was 5 years ago though). Am I sounding really old? I remember when bread was a nickel! What do YOU think? I'm sure by now it's obvious that I am completely smitten with this product. Have you ever tried it? Do you prefer sticker makers or just plain adhesive? If you have the Xyron 500, what do you use it for? I would love to know what you think! Okay, I never purchased one of these...but for applying glitter...this may have to be a new purchase! You enabler you! BTW, what is the best way to seal glitter on layout? I have the small X and the medium sized one. I LOVE both of them. I use the smallest one all the time. I am a ribbon addict, so this is used very often. I also use mine to adhere letters and intricate things on my layouts where my tombow won't work. I also love that my kids can use it. We cut out shapes and they make stickers with them, just like yours do. I do wish the refills were not as expensive, but I would not be without mine. Have considered buying one of these several times, but just couldn't imagine how much usefulness I would get out of it. Thanks for the review and the use tips - looking forward to getting one now! I have the small one and the large one. I use the small one for die cut letters. Works really well on the small ones. The larger ones are nice but can be rather pricey to use. All in all, I do like mine and use them frequently. I like that you can purchase refills at Walmart. My opinion is that these machines are a MUST if you own a diecutting machine. It's fabulous for putting adhesive on those little cut outs. As for the cost of the refills ... Michaels and Hobby Lobby put them on sale once in a while, and the rest of the time you can use coupons on them. Simply NEVER buy them for full price!! 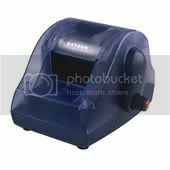 I love my Xyron, and used it alot when I was paper scrapping. Now I'm going to use it for fun projects for my kids. Do you have to be strategic about what you put through so you don't waste adhesive? For example, if you put 1/4" ribbon through the 1 1/2" Xyron machine, are you wasting 1 1/4" width of adhesive for the length of the ribbon? Thanks so much for reviewing this..thinking I need one now..been pondering..but i've gotten where I cut a lot of titles and thingies with my Cricut and that little glue pen takes FOREVER! Any my little girl DIGS stickers, so hmmmmmmm, lots of uses there..
thanks for enabling and will be purchasing one with my next HL coupon.. I have the small X one and use it for alpha and small things that I place on layouts. I love the idea of glittering chipboard with it and will try that very soon. I am wanting to get the largest one that goes up to 5" because I own the making memories slice now and can cut out letters and such up to 4" in size so this would be an excellent tool to have!!! I'm with Amy on the use of the xyron 150 with ribbon. I haven't done this because it seems like a huge waste of adhesive and I don't use much wide ribbon. I am also really annoyed by the adhesive webbing you mentioned when running die-cut letters through. This seems to be more of a problem with the 150 than the 250 for me. I love the idea of using it for chipboard---I've never done that! And I may need to try that glitter idea. Thanks for the review! I have a Xyron 250, have had it for 2 years and have never used it. It is still in its box never opened. I KNOW!!! Now after reading this review I am going to be putting it to good use! And your idea for making veggie stickers and the like? PURE genius! I'm addicted-I have all 3! I use the 150 the most-never thought about the glitter thing-wonderful idea. I always buy my refills when they are on sale at HL or Michaels. I have my ups and downs w/ this. As for those commenting on waste when doing a thin ribbon. . .yes it seems that way, but I have not found an alternate adhesive that works this well. The downs are totally about the 'web of adhesive' on die cut letters. . .only with me it's not some of the letters or just the inner part. I was told to go around the edges w/ a blunt pointer and that works, but really time consuming. I recently heard about adhesive sheets and I would like to find and try those as an alternate. I'm just really over this 'web' mess. Yay! Go Xyron! I love all their goodies! Thank you so much for that review!!! I have the 150 and 250 and love them both! What a fun idea to apply glitter - I'm going to have to try that. Thanks for a fun, new idea! I do agree with you about the web around my letters and ribbons, but to me it's a lot easier and faster than using a zigg's glue pen. I always purchase the refills at Michael's, JoAnn's or AC Moore either when they're on sale for 40% off, or I use a coupon for 40% off one item at those stores. I have the X and the bigger Xyron. I bought the blue one about nine years ago and used it once or twice. Then one day at a crop I needed to adhere some die cut letters and someone let me borrow their X. Naturally I ran right out and bought my own and have used it a lot. In fact, I still rarely use the big one. I agree the refills are spendy. Gotta use a coupon to afford them! Where can we buy them in bulk??? I also love my sticker maker. I mainly watercolor images for my cards. I prefer using lightweight watercolor paper so that I can cut them out if I choose. The paper always buckles with the water and the Xyron works great for this. I ran out of sticker stuff last night and had purchased the wrong size. Darn!!! 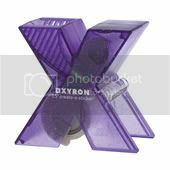 The xyron 900 was one of my first scrapbooking purchases years ago....and still my best and favorite tool! I love the choice of either permanent or repositionable adhesive or the option to laminate. The machine is the easiest thing to use....and with a 40% off coupon for Michaels, even the refills can be cost-effective. I have the 150 and the 500. I wish I would have gotten teh 250 instead of the 500. I don't have much of a need to items that large. I think I would have less waste. I love it for small letters, although I have had some webbing issues. I use a bone folder and carefully trace around all the letter and in the "open areas" and that seems to take care of most of the webbing. I have also used this for glitter..works great!!! The other thing I have done is made my own "chipboard". I cut an image 4 to 6 times from cardstock I run all but one image through the Xyron, I then stack the images and run them through the Cuttlebug just to get them to bond really well. I usually use glue dots to adhear to my final project. A cool trick with this is to do two layers (top and bottom) with a colored cardstock, then use white for the center layers, slightly sand the edges. I have thought abut trying it when using fun flock. I demo the "X" all the time at the store I work at. I have the 150 and 250 and love them both. I mainly use them for ribbon. I love both sizes and I use them all the time! I have two of these I have the 150 which I refer to as either my "baby x" or "baby zyron" I also have one bigger than you talked about takes 8 1/2 x 11 paper. I keep that for big projects and the cartiriges last forever-but to be without by baby x is unheard of--I have the original orange one and wouldn't tade it for the world-it's a stange color so it stands out and I use it for EVERYTHING! Glitter on alphas, die cut letters, flowers for my pages, leafing on those flowers when I want a little bling, other smaller die cuts for my cards, ribbon--sentiments again for cards, if any of you don't have one-get one-get two-you'll wonder what you ever did without it!! I have the little X one and the 510. I use the little one more often for letters. I agree about the adhesive sticking in the crevices. That always bothered me. The 510 I have used for many things, but more for non-scrapbooking things. I used it with a laminate/adhesive cartridge to make name tags for my Brownie troop. I also used it with laminate on both sides to make pool ball labels for some pool game my father plays with his friends. I made 2D pool balls with my cricut, laminated them with the Xyron and then added velcro so that they could move them around to the different holes on the pool table. I also laminated recipe cards with it. This is definitely a must have for me! I have both the 150 and the 500. I use them both all the time. 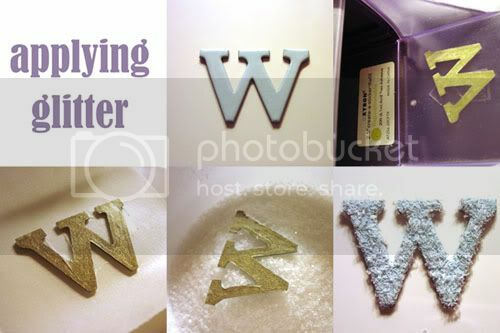 Delicate cricut letters, love it for ribbon, and I also love it for glitter and flock! I have the x & use it mainly for ribbon & small cricut stuff. I always feel that if the feeder isn't full I've wasted some adhesive. 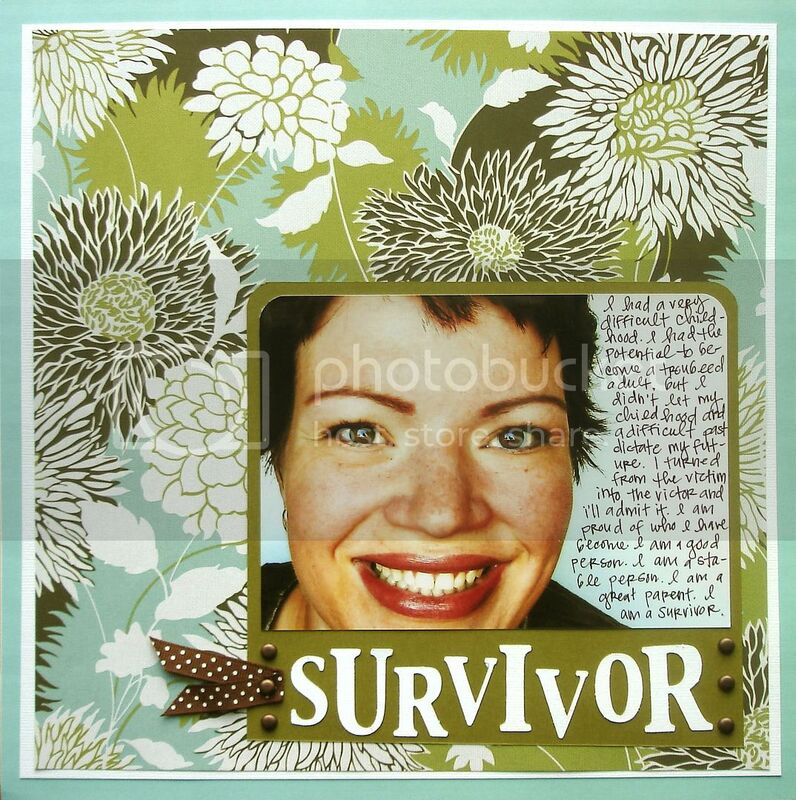 On another note... your Survivor layout was amazing. I love the journaling, as it expresses what I am and how I feel. It spoke to me & I am inspired to scrap lift if it's okay with you. It took a lot for you to use that as your sample & I applaud you for the bravery. I could not scrapbook without my 150. I use it all the time. I use it mainly for running my qk pieces through, even alot of the alphabets. Love it! I have one of the bigger ones, don't pull it out often but it's great to have. Thanks for the tip about applying gliter to chipboard. Great idea. I mostly use it for letters and the occasional paper piecing...but using it for glitter is a brilliant idea! Thanks TSR! I have the 250 and I love it. I use it for adding glitter and flkock- the same way you do the glitter, small pieces for paper piecings, diecut letters and phrases, ribbon. I try to buy it on sale or wioth a coupon so I can get my refills for about $8 at Michaels. I also keep things I want to go through it in a ziplock bag (if I don't need them immeadiately and then when i am doing something I will add on the other pieces so I am not wasting the width of it. I have the 1.5" and the 5" and use them both all the time. I use the 5" for attaching large bits of pp for greeting cards. When I had issues with the glue running beyond the edges, I just glittered it up. I know there are some things we don't want to sparkle and in those cases I use some Distress Embossing Powder. I could rub it off but I haven't run into any occasion where an undressed edge was better then dressed.